At Vino Al Lago, we are always fascinated about how the same fruit can vary so much in flavors and structure. We thought it would be fun and eye-opening to showcase the profiles of the four grapes used in the 2012 Vintage..
Its “mother” is the Mondeuse Blanche grape, and its “father” is Dureza -- indigenous grapes to the Alpine town of Ardeche. Its “grandfather” is Pinot Noir. Its has a combination of black and blue fruit. The secondary aromas include ash, smoked meats and black peppercorns from cooler regions. Chocolate, jam and coffee can come from warmer regions. 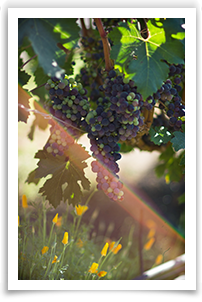 The Santa Rosa Valley produces a fine balance that includes both elements from both warmer and cooler climates. It has thick skins with medium acidity and medium tannin levels that dissolve on your teeth, as chalk would on a board.